This nautically-inspired 2 bedroom/2 bath garden level condo located in the Eaton Villages Ocean Edge is the perfect getaway. 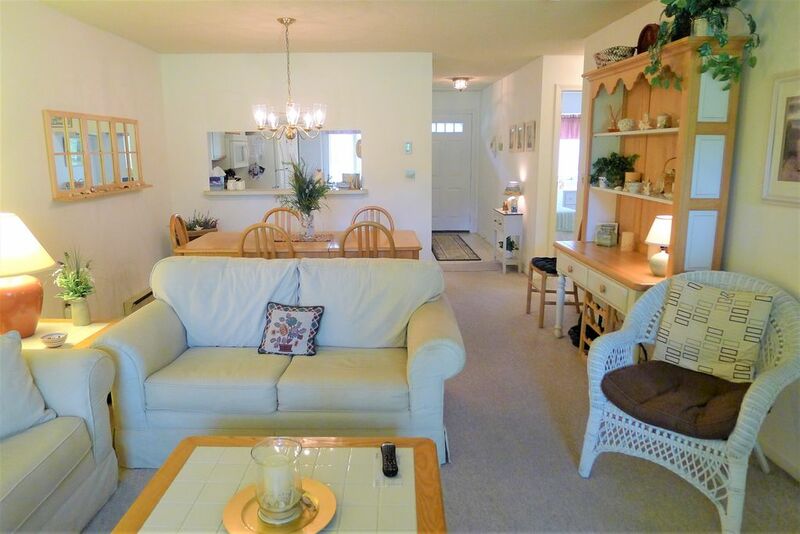 The unit is impeccably and comfortably furnished. And it’s situated within walking distance to Fletcher or Arbor pool complexes as well as the tennis courts and the Linx Tavern. Bright white with oak edging, the kitchen lacks for nothing and comes fully stocked including dishwasher, microwave, and even the lobster pot! It connects to the rest of the unit, both physically and aesthetically, through a large squared pass through so that the chef won’t miss any of the fun. You can also choose to dine on the covered patio accessed through sliding glass doors. It features dining table and chairs for 4, plus a charcoal grill for daily barbecues! The air conditioned living and dining area boasts a flat screen 42” TV with basic Comcast cable and CD player, two roll armed matching sofas configured into an L shape to accommodate all guests, and a rectangular dining table and chairs for 6. The decorative flair extends to both bedrooms. The main bedroom includes a queen bed, en suite full bath with shower/tub combination, a 38’ wall mounted flat screen TV, and a window A/C. The second bedroom has a set of twins, a window A/C, and its own 32” flat screen TV. Across the hall is the 2nd full bath with another tub/shower combination. This airy unit is the perfect oasis for anyone looking for relaxing respite from everyday (or not so everyday) stress in a truly lovely spot near beaches and shopping! Also included: washer/dryer, parking for 2 plus cars, WiFi. DO YOU HAVE TWO OR GROUPS WHO WANT TO VACATION "TOGETHER BUT SEPARATE"? ASK ABOUT ALSO RENTING 92 EATON DIRECTLY NEXT DOOR!! Guests of this home will have Ocean Edge privileges except access to the private beach area. The resort charges fees to use these amenities which will include the use of Fletcher indoor & outdoor pools, Fletcher cardio room, Arbor outdoor pool, the New Fitness Center with outdoor pool, and Tennis courts. This home does not include Golf privileges. You must complete your OE guest list and submit it to 10 days prior to your stay in order to have privileges. Remember all Ocean Edge fees are to be paid upon arrival to Ocean Edge. Very nice condo. Well furnished. Great location. Fairly clean. All appliances work well. Window unit AC worked well. Dehumidifiers. Vacuum cleaner didn't work. Kitchen really lacking in adequate pots and pans and serving bowls for anyone looking to do any serious cooking. Regarding Ocean Edge itself: Golf NA; beach NA; gym and pool at $70/wk/per adult. The rental process was quick and simple. Our accommodations at 96 Eaton Village were very comfortable and we met several other vacationers/residents in the neighborhood who were very friendly and fun to talk with. We will definitely consider renting here again.